CONVERSABLE ECONOMIST: Does Retirement Raise the Risk of Death? "Social Security eligibility begins at age 62, and approximately one third of Americans immediately claim at that age. We examine whether age 62 is associated with a discontinuous change in aggregate mortality, a key measure of population health. Using mortality data that covers the entire U.S. population and includes exact dates of birth and death, we document a robust two percent increase in male mortality immediately after age 62. The change in female mortality is smaller and imprecisely estimated. Additional analysis suggests that the increase in male mortality is connected to retirement from the labor force and associated lifestyle changes." This is a technical research paper that will only be accessible to the initiate, but you can get a good flavor of the results from a couple of figures. 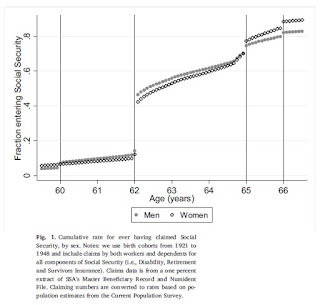 A first figure shows the patterns of claiming Social Security. There are various rules about the age at which different kinds of benefits can be claimed. For example Social Security disability benefits can be claimed earlier, but access to what most people think of as the usual Social Security Benefits starts at 62. 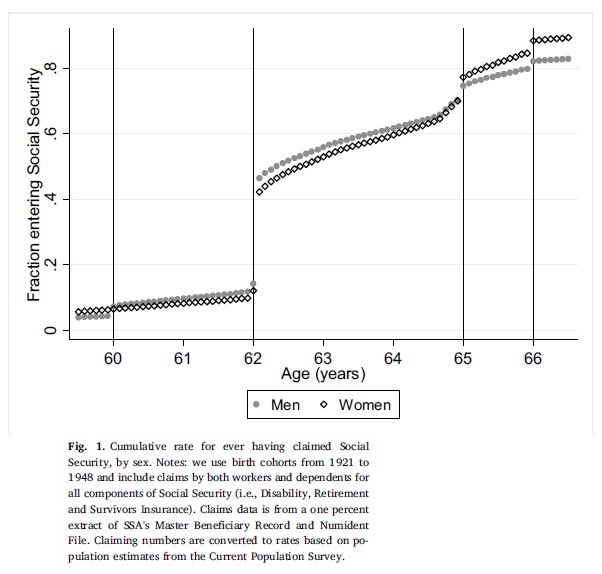 The figure shows the step-change or discontinuity in number of people retiring at 62, followed by a slower rise in claiming benefits and a smaller jump at age 65. There's also a step-change discontinuity in the death rate at age 62--but only for men, not for women. Mortality rates increase with age. As this figure shows, the mortality rate for women before and after age 62 is close to a smooth line. But for men, there's a jump. The authors dig into data on behavioral and economic patterns to see if they can find an underlying reason for this difference. Proving cause-and-effect here is very difficult, as the authors admit, but some patterns do emerge in the data. For example, there doesn't seem to be a gender gap in how income or health insurance coverage shifts at age 62. However, one difference is that men are more likely than women to stop working for pay when they start claiming Social Security. Men are more likely to start or increase smoking (even if they have never smoked before) and to become more sedentary. Men at age 62 also see a rise in deaths due to chronic obstructive pulmonary disease, lung cancer, and traffic accidents. In short, if you are retiring, take up a habit other than smoking. And if you know someone who is retiring, invite them for a walk and give them a hug.